Unfurl the banners of the Great Houses of Westeros! To secure power in the Seven Kingdoms, there is no more direct or lasting path to power than taking to the field of battle. When is a BattleLore game not a BattleLore game? Why, when it’s Battles of Westeros of course! Everyone was confused by the branding, but this new version of Richard Borg’s all-encompassing Command & Colors system, considerably fiddled with by Rob Kouba and set in George R. R. Martin’s world of Westeros, is actually a worthy holder of the name. Most originally, the restriction of ordering units in battlefield sections has gone, which makes things more interesting and less random. 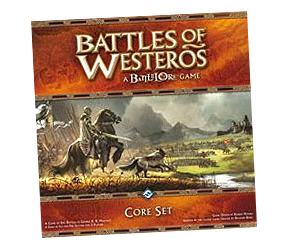 Battles of Westeros comes in a deep box, the same size as the original BattleLore. Inside you’ll find over 130 plastic figures belonging to the Stark and Lannister house factions, a double-sided mounted map board, several decks of cards, and a plethora of cardboard counters, along with a rules book and a book of battle scenarios. The figures are nothing particularly spectacular, and you may have to do a bit of work to straighten some of the swords and lances, but this is pretty much par for the course for plastic game pieces these days. Dip the bent figure part into a bowl of very hot water to soften, straighten it, then plunge it into a bowl of ice cold water to ‘set’. There’s a nice selection of individual heroes, and a good bunch of basic troops, cavalry, and archers for each side. The most interesting figures here are the kennelmasters—big bald guys holding on to a couple of snarling trained hounds each! BattleLore fans may be a bit surprised to discover that the figures come detached from their bases, and a decent amount of preparation is required to glue the figures into the bases. FFG suggest that gluing is an optional step, but really there’s no way that the figures would be usable by just pushing them into their bases. A few dabs of superglue, pressing the figures into the base slots with the end of a pair of tweezers, does the job well. No doubt the cost of producing these figures has increased since the initial release of BattleLore (in fact the CEO of FFG, Christian Petersen, has admitted on the company website that it is currently unaffordable to produce classic BattleLore in its original form and in the shorter print runs that FFG prefer). I was keen to have the figures painted for our first game, though of course you can happily play the game without painted figures. To make the task more manageable, I set aside the figures required for the first battle scenario and painted those in one batch; that way you can start playing the game without facing the daunting task of painting the entire 138 figures in one go. See my article Figure Painting for Beginners if you need some starting tips, but remember that washes are your friend! Painting the base colours of the figures and then giving them a wash (I used Devlan Mud for the Stark figures and Gryphonne Sepia for the Lannister figures) can give you fast and attractive results. So, your figures are painted (or not), you’ve downloaded the rules summary available on my website (or not) and you’ve set up the forces for the first scenario, Clash on the Kingsroad. The big question is, how does the game play? Well, the first thing to do is put thoughts of Memoir ’44, Command & Colors: Ancients, and BattleLore out of your head, because this is quite a different beast. Yes, there are many similarities, and the game certainly looks similar, but gone is the division of the board into three sections and the restrictions of activating units by section. Firstly, each player makes up a Leadership card deck with ten basic Leadership cards and five special Leadership cards for each of his commanders on the field. There’s also a new Morale track and a round track. The banners attached to each unit are different too; in addition to identifying unit types as usual, they have become an integral part of the game system, and are rotated to face the player to indicate whether the unit has been activated that turn or not. Basically, players roll a number of eight-sided dice equal to the Order Rating of the battle plan, and then take Order Tokens matching the symbols rolled. When it is a player’s turn, there are two ways to activate units on the battlefield. One is to spend one of your order tokens to activate a unit—for example, a blue shield token activates a blue banner unit. You can also spend two tokens of one type to activate any unit. This allows you to activate any of your units on the field. The other way is to play a Leadership card, and this is much more restricted by the position of your commanders on the field. The units (usually multiple units) activated by a Leadership card must be within your chosen commander’s Zone of Control—a radius of 2 hexes from the commander’s unit. Already you can see that this means the game plays very differently from your usual BattleLore game. It’s very important to keep your commanders alive—as I learnt when one of mine died early in our first game and the abilities of my units were suddenly very restricted! Also, the number of options available means that there is far less of a feeling of being controlled by your card draws. There’s definitely more strategy on offer here, which suits the more gritty, medieval feeling of the game, as opposed to the light, fun fantasy feel of classic BattleLore. As you activate units, moving and attacking with them in a way that will be familiar to C&C players, you rotate their banners to mark them as activated. You can’t activate them again that turn unless you manage to either play Leadership card to rally several units (ie, rotate their banner poles back and make them available for activation again) or spend a Morale order token to do them same to one unit (and take a morale hit to do so). So it is possible to activate a unit several times in the same turn. A small change to combat also introduces another level of strategy to the game: when you engage an unengaged enemy unit, you place an Engagement token between the units. Then, if you attack the target from another hex with a different unit, it is designated a flanking attack, and you get to re-roll all the dice of one symbol, which can be devastating. So instead of single discrete attacks and hoping to get the right cards to activate units on the same flank, you can really plan and execute multiple attacks that can destroy your opponent’s units. Another welcome change to the C&C system, I feel, is that victory conditions are no longer so reliant on just destroying the other player’s units. Not only does destroying a unit reduce your opponent’s morale—and in some scenarios you can successfully rout your opponent’s army as a result—but each scenario has specific victory conditions that are much more interesting, usually tied to controlling various objectives on the battlefield. All in all, I’m highly impressed by Battles of Westeros. FFG created an interesting, more strategic take on the classic system, though the branding is a bit confusing—it really does sit in an uneasy place between being a BattleLore-type game and a brand new game. Several expansion sets are available: Wardens of the West (Lannister), Wardens of the North (Stark), Lords of the River (House Tully), Tribes of the Vale (Clansmen), Brotherhood Without Banners, and House Baratheon. I also like how the individual commanders really stamp the game with their personalities and style of play, depending on their special abilities and selection of Leadership cards. If you’re a fan of other games in the Command & Colors family and you’ve been wondering if Battles of Westeros was just more of the same, I can safely say this game has something new and exciting to offer. This comprehensive rules summary and reference set includes all the current expansions. I managed to get it, but thought you’d like to know about the broken link. Thanks for letting me know—they’ll be a few small rough edges here and there as the EOG sets up its new digs: link error fixed! I do also appreciate your understanding that the work of the Order takes time and money, and while content will always be free, a small donation if you find something very useful to you is most gratefully received. It goes back into more games—and so back into more good content! Thanks Dreddnought! I’ll be adding reviews to the Proceedings (blog) section which will then take their rightful places in the individual game listings. I’m very pleased indeed that I introduced you to AT-43 and Dreamblade—two of my favourite games as well and it’s a great shame they were both discontinued. You have superior taste! I don’t know what you mean. Me, lose? Who is this imposter? Have him ejected! I own this now. It is in a kind of holding pattern over my painting desk behind Zombicide, Dreadfleet and Mansions of Madness. Poor neglected bastards. It is a pain in the neck to paint but looks fantastic on the table when it’s all done. I’ll get some pictures of my painted figures on this page very soon.